Gaining muscle mass is a strategic exercise. You must plan out the correct exercises, you must eat the right foods, you must drink the proper amount of water, etc. These are all key ingredients to maintaining healthy muscle gains. But, has anyone ever told you, there are also things you can do to prevent or impair muscle growth? Of course there are exercises that hardly promote muscle growth, but what about food and drinks? What should you really stay away from? If made right, this little piece of heaven can be the most decedent pastry in all the world. However, it will impair your muscle gains astronomically. Why? These delights are made from a ton of flour. Then, they are put in oil and fried to perfection. But, nothing about this process, or the ingredients placed in the doughnut recipes, is healthy for you or your muscles. There is not even a 1% chance that it can be beneficial to any muscle in your body. Instead, pick up some Greek yogurt and throw some fresh fruit on it. This sweet snack will have your taste buds watering in no time. One bagel, store-bought or bakery-bought, has 400 calories. And that’s without the added butter, cream cheese, or jam. 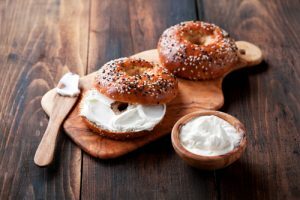 Bagels are 100% refined carbohydrates, which leads to absolutely no healthy nutrients for your muscles to enjoy. Instead, grab a slice of whole grain bread and add some natural peanut butter. It’s healthier for your body and your muscles. Processed meat is never good for muscles, and sausages are one of the top “craved” processed meats, especially for breakfast meals. But, what most people don’t understand is that sausages have more than one icky factor. Put aside the fact that they are known as processed meats, and you come to find out that they are also high in calories, sodium, and saturated fats. Three major muscle impairment factors. Instead, choose lean meats to indulge in like the “flat iron” cut steak. Granola bars can be healthy, at times, so I will be very specific in what granola bars to avoid here. 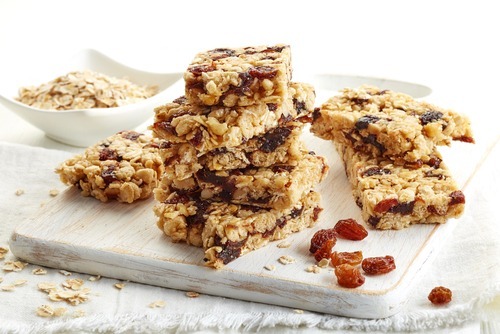 Many granola bars are filled with oats, dried fruits, and nuts. However, there are still some granola bars that include chocolate, candy pieces, and fudge in their recipes. These bars tend to have more calories, sugar, and fat in them. In the end, this can impair proficient muscle growth. Instead, choose granola bars with 200 calories or less, if possible. Typically, these are the healthier versions. This may come as a shocker to you, but reduced fat peanut butter really has no benefit to your muscles. Because, if the fat present in peanut butter is taken out, it’s usually replaced with other ingredients. This can consist of any type of sugar, additive, or preservative, and you definitely want to watch out for such ingredients I you’re building your muscles. Plus, reduced fat peanut butter tends to have a hell of a lot less protein in it compared to the natural kind. Instead, always choose natural peanut butter, if possible. Every cheese contains a certain amount of sodium and fat, we know this. However, most cheeses also contain important nutrients to help muscle gains. Cheeses that don’t get the job done are the processed cheeses out in the markets. 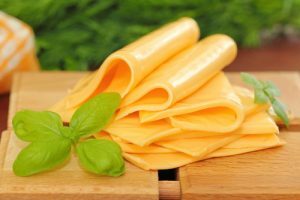 Processed cheese contains less protein than unprocessed cheese. Furthermore, processed cheese has a list of added ingredients that you don’t want anywhere near your body. Instead, choose unprocessed cheeses like cheddar and parmesan. No matter how could it is, try your best to stay away. Typically, one serving of ice cream equals approximately 140 calories. This equals out to 7 grams of total fat, 4 grams of saturated fat, and only 2 grams of protein. The cons outweigh the pros in this situation. Not only that, but one serving of ice cream has 22% of the daily recommended amount of saturated fat you should put in your body. Plus, when people sit down to eat ice cream, chances are they’ll eat more than one serving (of ½ a cup). This does not help build muscle at all. Instead, choose nonfat Greek yogurt that helps build muscles. Yes, they are healthy for you, there’s no question about that. But, are they helpful in gaining muscle? No. For example, celery, spinach and lettuce are extremely healthy for you. However, they fill you up without providing the calories you need to build the desired amount of muscle you are aiming for. Instead, pick up some beets, broccoli, avocado, and potatoes next time you’re at the supermarket. Coconut oil is said to be super healthy, but it should definitely not be incorporated into every meal. Coconut oil contains approximately 120 calories per tablespoon. That’s outrageous. You can turn a perfectly good meal into an unhealthy mood instantly with this. And, coconut oil does not contain omega-3 fats to help take away some of the inflammation in your muscles. Instead, choose oil such as canola oil. Also, whatever oil you choose to use, be sure to use it at a minimum. Alcohol is not the best drink for your body, you know that. And, in regular increments, it can really damage your muscle recovery. But, the most detrimental side effect alcohol has is its ability to put more stress on your body. By consuming alcohol on a regular basis, you are depleting the amount of antioxidants you have to aid in muscle recovery. Instead, those antioxidants are now trying to relieve your body of the stress alcohol has put it under. Instead, keep your alcohol consumption to a minimum. If you choose to drink, have no more than two servings of alcohol a day: 12 ounces of beer, 5 ounces of wine, or 1.5 ounces of hard liquor each equal one serving. Pre-made smoothies sound like a good idea, and taste like a good idea, but they aren’t a good idea. But I get it. You’re on the go and you want a quick pick me up, and that smoothie shop down the street from work just seems like the ideal choice. Wrong. So many pre-made smoothies are loaded with calories. On average, a pre-made smoothie can be up to 1000 calories. And, they contain an astronomical amount of sugar that you really don’t want to be putting into your body. Instead, grab some fresh fruit and other ingredients to make your own smoothie at home. At least you’ll know exactly what you’re putting into your body. Soda tastes so good. That bubbly sensation filling your mouth, that sugar overload targeting your sweet tooth, that nice, refreshing taste of a newly opened bottle of Coca-Cola. Well, I hate to break it to you; It’s not good for you. Soda is sugar water. Nothing about soda is beneficial to your body. Too much sugar and caffeine intake from this drink can actually weaken bones and muscle recovery. And, not to mention that drinking soda deters you from drinking a beneficial beverage, like water. Instead, choose your drink of choice more carefully. Go with water or a glass of low fat milk.